Often classified as a Naive artist, Colette Beleys is more accurately described as an “instinctive” painter. Spotted in 1939 by the German dealer and collector Wilhelm Uhde, she worked in a poetic, primitive style similar to Le Douanier Rousseau, whose work she greatly admired. Constructed with considerable freedom and inventiveness, this picture is inspired by a place in the Alps near Samoëns. 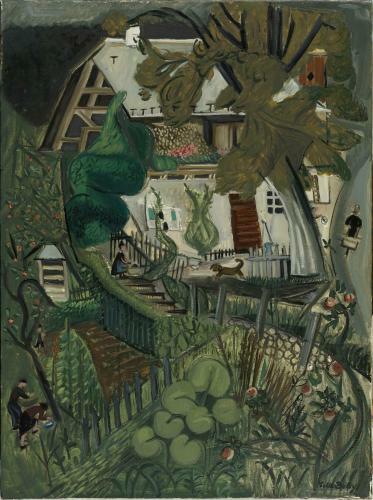 It was exhibited in the Jeanne Castel Gallery, and bought by Jean Cassou for the Musée National d’Art Moderne in 1951.